Paintings For Sale: Pre-made Paintings available at various boutiques & galleries around the country. Click on the images to be directed to the corresponding sale page. Shop all available pre-made artwork! 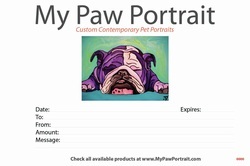 My Paw Portrait Coffee Table Books! Can't decide on what to give that special someone? Give them a Gift Certificates!